This easy breezy navy dress will soon become your new everyday favorite! The Everyday Favorite Navy Dress has a rounded neckline, three quarter sleeves, and a flowy skirt. We love the loose, blouson cut of this dress. 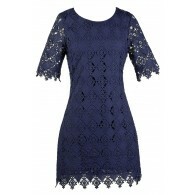 Lace trims the front of this dress as well as each sleeve, adding a girly touch. This dress is a bohemian look that pairs well with gladiator sandals or wedges in the summer and boots or heels in the Fall and Winter. Gold jewelry or a boho headband would make the perfect finishing touches. Details: Lined except at sleeves. 100% polyester. Lining: 100% polyester. Hand wash cold, gentle cycle. Do not bleach. Tumble dry low. Cool iron if needed. Small measurements: Length from top of shoulder to hemline: 34". Bust: 34". You have added Everyday Favorite Navy Dress into Wishlist. You have added Everyday Favorite Navy Dress for Stock Notification. You have set Everyday Favorite Navy Dress as a loved product. You have removed Everyday Favorite Navy Dress as a loved product.